Orca Confirms New High Grade Zone a | Orca Gold Inc.
VANCOUVER, BRITISH COLUMBIA--(Marketwired - Sept. 10, 2014) - Orca Gold Inc. (TSX VENTURE:ORG) ("Orca" or the "Company") is pleased to provide an update on exploration at its Galat Sufar South ("GSS") prospect on its 7,000km2 Block 14 mineral license in Sudan. Orca holds a 70% interest in Block 14. Orca's current Mineral Resource at Galat Sufar South ("GSS") comprising Indicated Resources of 22.2MT at 1.84g/t for 1.3 million ounces of gold and Inferred Resources of 6.5Mt at 1.9g/t for an additional 0.4 million ounces of gold, was reported in its news release dated January 29, 2014. Ongoing exploration in Block 14 continues to demonstrate the district scale nature of gold mineralisation in the permit with large numbers of targets being defined and extensive artisanal mining activity. The license has had little or no modern exploration other than work performed by Orca. Since the previous exploration update (News Release: May 26, 2014), Orca has completed 3,531m of RC drilling including 2,635m aimed at targets within 2km of the GSS resource and a small 521m program at the EG3.2 prospect (see Appendix A for plan map of Block 14). Results from our recent exploration program continue to show the potential to increase Orca's resource inventory. Ore grade mineralization over significant widths has been intersected in three priority target areas that will now be followed up with infill drilling with the aim of defining resources by the end of the first quarter of 2015. (See Priority targets map at Appendix B). No material from these priority areas is included in Orca's current resource. 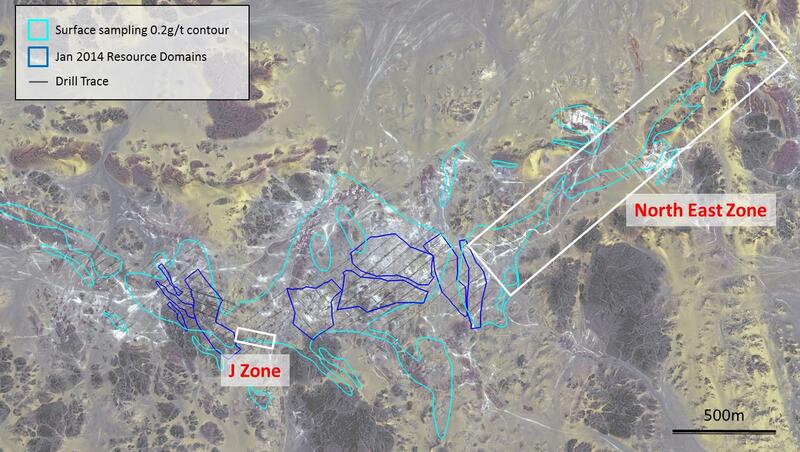 The high grade J Zone lies just south of the Main Zone resource at GSS. Four holes were drilled at J Zone to follow up on encouraging trench results and a high grade intercept in hole GSRC103 drilled in 2013 (16m @ 8.47, 16m @ 5.57g/t cut). All holes intersected high grade mineralization as tabled below and define mineralisation over 200m strike, on the margins of the current resource. J Zone has the potential to connect westwards into the 320 Zone of the resource and is open to the east where the structure can be traced for several hundred metres in surface sampling, continuing into the untested F target. As our understanding of the geological controls strengthens, we are now beginning to be able to connect a number of previously identified targets. Orca has developed a 1.5km, NE striking resource target extending from the eastern edge of the current resource, linking a number of previous prospects (East of East, Carbonate Ridge SE, NW Target) (Map appendix A). The mineralized trend has been defined in detail by surface sampling and the table below details results of drilling to date within this trend (* marks previously released holes). Mineralization is similar in nature and style to the GSS resource however to the north east mineralisation is also hosted by the prominent carbonate dominated ridges that characterize the area north of the resource and the discovery of mineralisation in this new setting is leading to the re-evaluation of the carbonates as a whole. Systematic fence drilling of this 1.5km trend will begin in September 2014 with the aim of adding additional ounces into the GSS resource inventory. Alteration and gold anomalism is present over a wide area at GSS. GSS is a large mineralized system with much of the area under sand cover. Drilling at other targets continues to return positive intercepts, notably 19m @ 6.04g/t (19m @ 3.91g/t cut) at Target NE, just north of the North East Zone and one hole at target A which returned multiple intercepts including 5m @ 2.45 g/t, 12m @ 2.3 g/t and 4m @ 4.2 g/t (4m @ 3.85 g/t cut). We continue to prioritize new targets for ongoing surface testing with a view to potential future drill testing. The EG3.2 Prospect sits approximately 60km east of GSS on the eastern side of the regional Keraf shear zone. 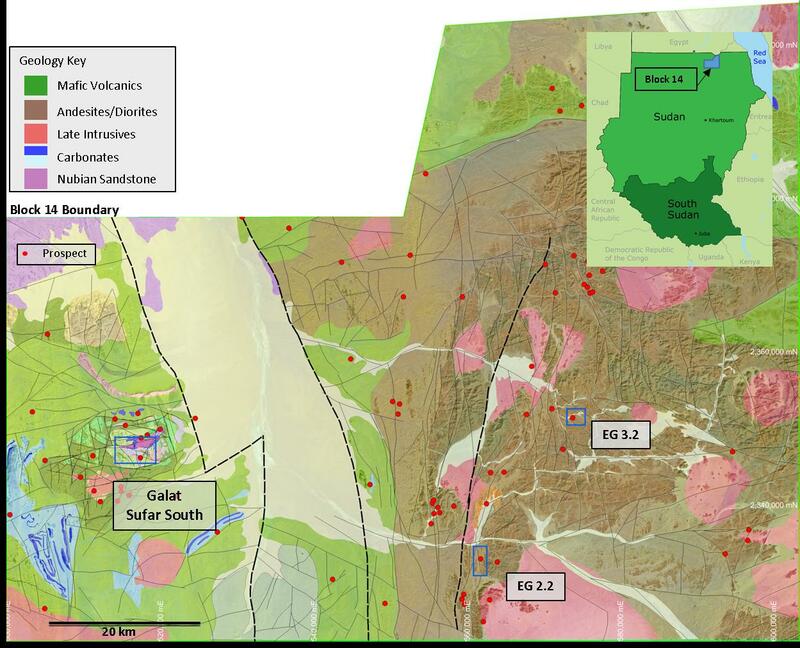 The first drilling at the EG 3.2 prospect (news release dated May 12, 2014) defined high grade mineralisation associated with artisanal workings at the base of a small hill where surface sampling had identified widespread gold anomalism. The latest round of drilling has been successful in confirming a second mineralized zone outcropping over a strike length of 300m, on the eastern flank of the hill. Drill coverage is incomplete and of the two holes drilled, GSRC390 returned anomalous grade over its complete 100m length. Drilling is now planned to start in September to systematically drill EG3.2 which shows anomalous gold grades in surface sampling over 350m strike and up to 200m width. Commenting, Simon Jackson, President and CEO, said, "Block 14 continues to justify our decision to operate in the north of Sudan. In a very short time our work on Block 14 has developed from reconnaissance exploration to discovery, to resource definition and now to resource expansion. At the same time, continued generative exploration has resulted in a new discovery, 60 km away from GSS, still on Block 14. The prospectivity of the Nubian Shield continues to impress and this geological setting clearly has the potential to be a new world class gold region. In the current challenging gold price environment the focus has to be on grade. The GSS deposit has both grade and significant size potential, as demonstrated by the results of our work this summer. We continue to be excited by the results at both GSS and EG3.2 and look forward to reporting a revised resource estimate in Q1 2015." To view "Appendix A: Block 14 Permit Showing Prospect Locations" please visit the following link: http://media3.marketwire.com/docs/OrcaGold-AppendixA-91014.jpg. To view "Appendix B: Galat Sufar South Priority Targets for infill drilling" please visit the following link: http://media3.marketwire.com/docs/OrcaGold-AppendixB-91014.jpg.